If you are not used to drinking 8 glasses of water per day, it can get very difficult for you start all of a sudden. Water is very important to keep you skin clear, flush out toxins and maintain your metabolism and weight. The quantity of water needed varies from person to person and depends mainly on one’s age, weight, physical activity etc. In today’s guide, we will discuss easy ways to drink more water. 1. Start slowly, start today! You need not start drinking 8-10 glasses of water per day on the first day itself. Start small. You can sip a glass or two of water slowly and try to drink at least 4 glasses in the beginning, then slowly build up. Measure how much water you drink daily. You can invest in a bottle having clearly marked ounces or milliliters on the outside. You can also note down the quantity in a journal. This will help you keep a track of the amount you drink each day. Try to slowly increase this amount. Don’t worry if you have not been drinking enough water until now; it is never too late to start. As they say, today is the first day of the rest of your life. Start today and very soon you will reach your water drinking goals. People often fail to drink enough water because of sheer laziness. To avoid having to walk to get a drink of water from the kitchen or your office water cooler, keep a huge bottle of water handy at all times. Keep one on your desk, in the car and also carry one around the house or when you work in the garden. These days, there are mobile apps you can download to remind you to drink water. Apps like Waterlogged help you keep tabs on how much you have drunk and also remind you to drink more. You can use the free version of the apps but upgrade later, if you like. There are many awesome features once you upgrade such as syncing it with Fitbit or other fitness apps and so on. You can even add your own containers in case you do not drink from standard 8 oz glasses/containers. If apps are not your thing, you can set alarms on your watch to remind you to drink water. If plain water is boring for you, make it more interesting by adding fruits, lemon slices, cucumbers, crushed mint leaves etc. 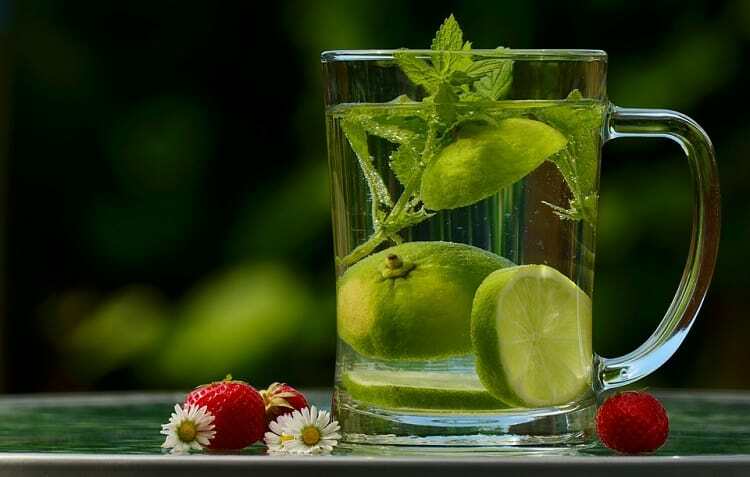 Infused waters, also called detox waters, are fun, tasty and refreshing and can take away the taste of plain water which many people dislike. They can also help flush out toxins and can help you lose weight over time. When offered a choice at parties or in restaurants, choose water in place of soda, caffeinated drinks or alcoholic beverages. By making these simple changes, you can easily lose 15 pounds in a year’s time. The less sugary juices, sodas and sports drinks you stock up on, the more water you will automatically drink. Drink plenty of water when you workout, walk, swim or jog. Active people lose a lot of water through sweat so it is important for them to drink even more water. Make everyone around you drink more water; stock the refrigerator with water bottles and pass one around when you watch TV or do activities together. In the beginning, you will find it annoying to pee several times. But, as time goes by, your bladder will adjust and regulate itself. Soon, you won’t feel the need to pee so many times. Water is the elixir of life; our body is made up of nearly 60-70% water. Naturally, we all need to drink a lot more of it than we currently do. So start drinking more water using the above easy ways and see the difference it makes to your health and well being.